INDIA often finds itself in the midst of debates on climate change. But there is very little country-specific research available to guide climate-related policy. In 2010, researchers and policy advocates on climate change came together to form a network to promote quality climate research in the country. Three institutes, IIT-Delhi, IIT-Madras and Centre for Science and Environment (CSE), established the Indian Climate Research Network (ICRN). The network boasts over 150 members. The aim of the network is to ensure that climate change debate reaches a wider audience in the country, bridge the communication gap between the scientific community and those outside it and provide the fledgeling research community a platform to come together for discussions and debates on climate change. ICRN held its third national research conference from November 3 to 4 at its most recent addition, the Indian Institute of Science in Bengaluru. The conference showcased the best climate change research being carried out in the country. Over 70 presentations and posters on the science of climate change, its mitigation, adaptation and impacts were discussed. “The quality of presentations at the conference has definitely improved but we still have a long way to go before reaching international standards,” says Krishna Achutarao, professor at IIT Delhi, who is one of the networks’ founding members. Valued at Rs 350 crore, the oil sardine fishery in India is a massive export-oriented fishery. It is a low-priced fish that provides nutrition and sustenance to millions. Back in the 1960s and 70s, it was found only on the western coast of India. But over the years it has extended its territory to the east coast as well. E Vivekanandan of the Central Marine Fisheries Research Institute in Chennai says oil sardines, tropical fish with a preference for warm waters, normally live in seas with a water temperature above 28°C. Climate change has caused sea surface temperature along the Indian coasts to rise, thus providing these fish with new grounds to inhabit. He says it is important that such information gets effectively communicated to the fisher communities to help them adapt to changing fishing patterns and ecosystems. Releasing sulpahte aerosols into the stratosphere to reflect sunlight is one of the several potential geoengineering methods proposed to counter global warming. Angshuman Modak from Indian Institute of Science in Bengaluru explored the sensitivity of climate to distribution of sulphate aerosols at different latitudes. He found that for a fixed amount of the aerosol, more efficient temperature control is achieved when the aerosol is concentrated more in the tropical regions than when it is uniformly distributed. The study, thus, indicates for a fixed amount of the aerosol different temperatures are possible, depending on the latitude. This highlights the need for a careful evaluation of stratospheric geoengineering proposals. The most popular estimate of the amount of electricity that can be produced in the country through wind energy is 49-103 gigawatts, done by Chennai-based Centre for Wind Energy Technology (CWET). These figures have been contested and studies by different institutes have arrived at higher figures for the wind energy potential of the country. A reassessment done by two researchers at IIT-Delhi, Chetan Krishna and Abhishek Malhotra, using realistic parameters puts the potential at 313 gigawatts at 20 per cent capacity factor. The factor is the extent to which an area can satisfy an identified parameter, such as the height of the wind turbines. 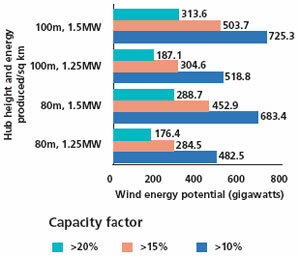 Lower the capacity factor, less suited is the site for wind energy production. Greenery is giving way to concrete jungles in Bengaluru, the garden city of India. Harini Nagendra from ATREE, a research institute in Bengaluru, provided a narrative on how urbanisation is leading to removal of trees. She compared the suspended particulate matter and temperatures on roads with and without trees in different localities. Roads with trees had significantly lower level of suspended particulate matter and temperatures up to 3-5°C lower than those without trees. With over 600 million people expected to be living in cities by 2030 in India, her study makes a case for increasing tree density in cities. The lachenpas and the dokpas are nomadic shepherd communities on upper slopes of the Eastern Himalayas in Sikkim. They have responded to changing climatic patterns using indigenous knowledge. Tenzing Igty of ATREE, a research institute in Bengaluru, interviewed members of these communities to show how traditional ecological knowledge can complement scientific studies, especially in a region like the Eastern Himalayas with limited literature available on climate change impacts. Interviews with the Dokpas reveal that a combination of less snow, shorter winters and erratic rainfall has made the pastures drier leading to poor quality of grass. Due to this their sheep are dying. They have now started replacing physically weaker sheep with yaks as an adaptation strategy. In turn, the Dzumsa, their governing body, stepped in to ensure the price of sheep remained stable and placed a ban on slaughter and sale of sheep. In another instance, the Dzumsa, which traditionally oversees the type and timing of crops for different villages, introduced crops like maize, cabbage and pumpkin which previously could not grow at such high altitudes. With the growing need for adapting to climate change, comes the need to prioritise areas for resource allocation, based on their exposure and vulnerability. Based on factors like robustness of agriculture, industrial activity intrusion and water and sanitation, Namrata Ginoya of Environmental Management Centre, a consultancy in Mumbai, assessed the extent to which six villages in Anjar Taluka of the Kutch region are vulnerable to climate change. She surveyed 110 households, covering factors like socio-demographic profile, health, water, food and livelihood, to arrive at vulnerability indices for each of the villages. Based on the study, Vira emerged as the most vulnerable village of all. Ginoya proposes developing a climate-resilient plan for this village, taking into account its economic, demographic and ecological capacities. One of the options, as suggested by her, is regeneration of severely damaged mangroves along the village coast that act as barriers against storms and boost the value of fishery. Most unfortunate, the author has no knowledge on the people working in the field of climate change in India. It appears all those groups working in the arena of IPCC and Al Gore appears to be only group known to the present writer. Even the groups associated with IITs & IIMs are also thinking in narrow lane but not thinking in a broader context. I started my carrier in IMD, Pune. I was one of the scientists recognised at international level as back as 1976 by Solare Terrestrial group of American Academy of sciences. I brought out a book in 1993 based on my work up to that time. Here applied climate change adaptation in agriculture for several developing countries. This was presented for India by BS publications in 2002. I brought out a book "climate change: myths & realities" in 2008 -- available at www,scribd.com & Google Books. Later extended this to Andhra Pradesh in 2010. Also extending the work to agriculture in 2011. All these are available at the said internet reference. In fact I am one of the scientist fighting against the IPCC impacts and global temperature rise by moddlers -- sea level rise, glaciers retreat in Himalayan region, extreme weather including precipitation, cyclonic storms. In its summary report released in Kampala in Uganda in November 2011 IPCC retreated from its sensational impacts. Yet World Bank and Western MNCs are harping on the past observations of IPCC. The same is the case with Indian groups. Even they briefed the Minister based on truncated data saying that Indian rainfall is reduced -- which he briefed at Parliament. This is our state of affair on climate change. No body likes to work on the observed data but interested spend on computer and present sensational reports to press. The study on the CLIMATE CHANGE is the need of the hour with sustainable solutions. As quoted by the authors "but there is very little country-specific research available to guide climate-related policy", the statement don't indicate whether it is computer / theoretical based research or data based research. The team of ICRN should have done the literature study before conducting the Conference in Bangalore. If so, the work done by DR SJN would have been reflected before making such statements. This is the general logic for any common man. It appears there is exists gap in the literature study and the planning of ICRN Conference. Certainly the available e-technologies will help the concerned group to get the updates with out missing any significant information. Probably the coordination between these groups will resolve the issue and hep to update the status of research on the most needy topic of CLIMATE CHANGE. HonÃ”Ã‡Ã–ble, Sir, I would like to bring to your kind notice on the latest information on Ã”Ã‡Â£Climate ChangeÃ”Ã‡Ã˜ for your Kind information and remedial action. Ã”Ã‡Ã³	It is likely that the effects of urban heat islands and land use have not raised the centennial global land surface air temperature trends by more than 10% of the observed trend. This is an average value; in some regions that have rapidly developed urban heat-island and land use change impacts as regional trends have been substantially larger. This I included under man induced variations associated with ecological changes. They are highly location and regional specific and needs realistic estimates. Ã”Ã‡Ã³	Internal variability as well as solar and volcanic forcing may have significantly influenced the pattern of temperature. In the case of troposphere heating and stratosphere cooling have medium to low confidence. Ã”Ã‡Ã³	In the case of sea ice issues it a short term data Ã”Ã‡Ã´ we can call this as truncated data series. Thus the results are less relevance to understand the long term trend. Also, Antarctica results show strong regional differences. Ã”Ã‡Ã³	In terms of glaciers length, area & mass change there is robust evidence in high agreement that globally, glaciers continue to shrink and loses mass. There are however, notable regional exceptions to these trends in length, area and mass change resulting regionally-specific climatic conditions or from glacier specific characteristics unrelated to climate. 1920s to 1940s, ice loss from glaciers in the Arctic, mainly from the Greenland and peripheral glaciers was higher than today. Ã”Ã‡Ã³	Regional mean sea level change can be significantly different from the global mean change. It is virtually certain that global mean sea level has risen at a mean rate between 1.4 to 2.4 mm/yr during the 20th century and between 2.7 and 3.7 mm/yr since 1993. Regional rates of sea level changes are often higher or lower than the global mean inter-decadal periods. Ã”Ã‡Ã³	Generally, there is medium confidence that the length of warm spells, including heat waves, has increased since the middle of 20th century. Ã”Ã‡Ã³	Consistent with AR5 conclusions, there have been statistically significant trends in the number of heavy precipitation events in some regions. Ã”Ã‡Ã³	New results indicate that the AR4 conclusions regarding global increasing trends in hydrological droughts since the 1970s are no longer supported. There is low confidence in observed large scale trends in dryness. Also observed low confidence in the magnitude and / or frequency of floods on a global scale. Recent reassessment of tropical cyclone data does not support the AR4 conclusions of an increase in the most intense tropical cyclones or upward trend in the potential destructiveness of all storms since the 1970s. Ã”Ã‡Ã³	There is still insufficient evidence to determine whether robust global trends exist in small-scale severe weather events such as hail and tornadoes. From all these it is clear that the regional variations are dominating over the global variations. Also, IPCC has not attempted to separate the regional effects from global average. Unless this is done, it is not possible to get realistic effect of greenhouse gases on temperature and thus other impacts. Sea level rise donÃ”Ã‡Ã–t realistically follow the sea surface temperature rise. Henceforth, government must stop taking decisions on climate change related issues from IPCC reports or World Bank, CGIAR, Oxfam, etc reports that serve the MNCs interests Ã”Ã‡Ã´ dump in to dustbin such reports like that what the government has done in the case of Report on Dams by World Bank. Also, government must stop patronizing Indian groups working for IPCC and Al Gore. We appeal you, Sir, let the government create a cell under your chairmanship and look in to climate change aspect in relation to India. India is a major agriculture country, this is very important. I had highlighted some of these issues in my books Ã”Ã‡Ã´ Ã”Ã‡Â£GreenÃ”Ã‡Ã˜ Green Revolution: Agriculture in the perspective of Climate Change (2011)Ã”Ã‡Ã˜ and Agroclimatic/Agrometeorological Techniques: As applicable to dry-land agriculture in developing countries (1993)Ã”Ã‡Ã˜. One of the most disturbing issues in the domain of climate change research is that some of the loudest voices come from non-scientific people, as reflected in the comments above. Climate change research is not dominated by MNCs, far from it - careful, systematic, deliberately cautious work is carried out by independent scientists and researchers in universities, often with precarious funding, and published in respectable peer-reviewed journals, including ones like Nature and Science. It is the so-called 'sceptics' who are funded by front organisations like the Heartland Institute, which is known to be heavily supported by the likes of Exxon-Mobil. For those who want to sift through the morass of confusing information, see credible sites where the dubious claims are debated and clarified for what they are worth. Chella Rajan -- have you in your carrier looked in to the literature, whether the commentators are scientists or not? I think even before you are born, climate change issues were studied and applied to agriculture [book published in 1993, review appeared in Agric. For. Meteorol. 1994 issue, reviewed by Vice-President of WMO/UN and in-charge of agriculture meteorology group -- you can also see international journal of agriculture meteorology or Indian journal meteorology & oceanography or look at the book edited by me & Gupta published by Tata McGraw-hills in 1999. In 1970s was there an issue of global warming, sceptics and heartland funding!!! You started talking on peer reviewed publications -- was it different from the line of IPCC/Al Gore? Have you changed even after IPCC changed? Please don't waste your time and others time by writing such comments. Talk some science. If you don't know keep quite!! Dr. S. Jeevananda Reddy: I am a little confused by your complaints. If you are advocating more study and research, what is the problem with a research conference where people present their research? A quick web search would have revealed that this conference actually called for abstracts and anyone (including you) could have sent an abstract of his or her research. Many people did and this article is a report on some of the work presented. It does not suggest that it is the only work being done on climate change nor that this is the only legitimate work. The value is in the work and not to your age or your qualifications or affiliations. Krishna Atchta Rao -- I am not worried about the conference or the people gathered there to form a group. My observations related to the first para of the write up of the article "INDIA often finds itself in the midst of debates on climate change. But there is very little country-specific research available to guide climate-related policy. In 2010, researchers and policy advocates on climate change came together to form a network to promote quality climate research in the country. Three institutes, IIT-Delhi, IIT-Madras and Centre for Science and Environment (CSE), established the Indian Climate Research Network (ICRN). The network boasts over 150 members." This para I considered a false statement and thus put my observations. I don't think you read my observations in that context. So,You need not worry about my age or submitting an abstract to that trash "you scratch my back and I scratch your back" conference. Every other day even in Hyderabad, people organize such conferences.